The alarm sounds at 5am. On this particular occasion, it was mine. Of all the awe inspiring, challenging, heart pounding, and oxygen depriving activities we planned for our road trip, I had been looking forward to this ride the most. I may not be a keen cyclist, but I’ve heard of this mountain. I’ve seen footage of Hill Climbs from years past. I’ve always wanted to visit this mountain. 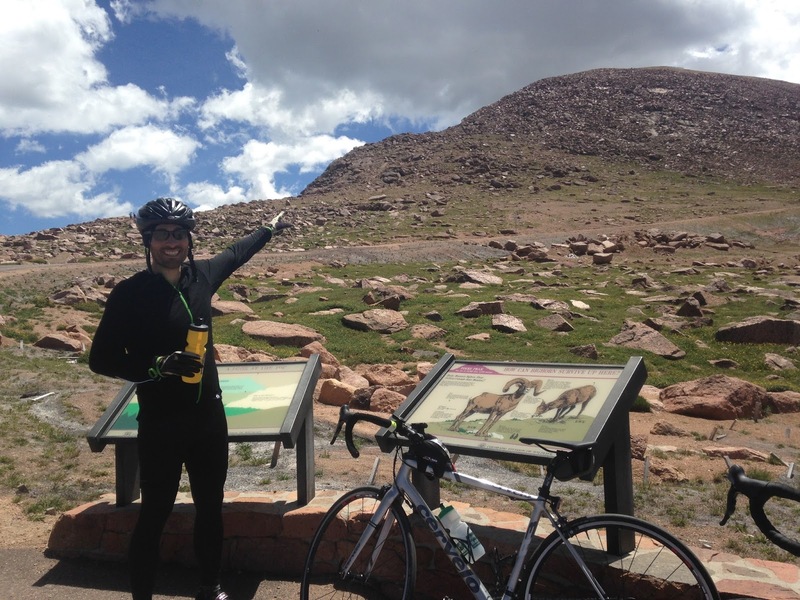 And when I found out it had been paved all the way to the summit, I knew I had to ride it! After a successful summit of Mt. Evans a few days earlier, we felt more confident but still somewhat nervous about this ride. Similar to Mt. Evans, today’s weather called for a 10% chance of rain. 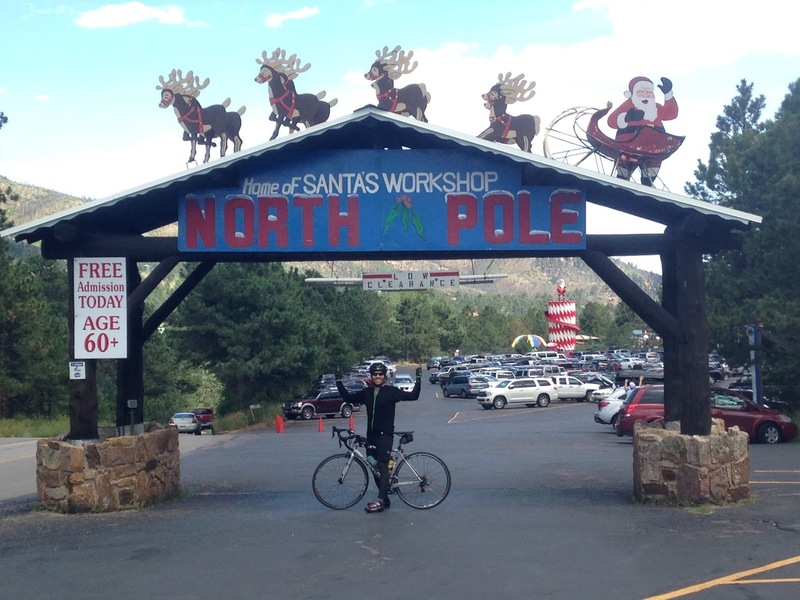 At 7:44am, we left the public parking lot in the center of Manitou Springs and began pedaling. 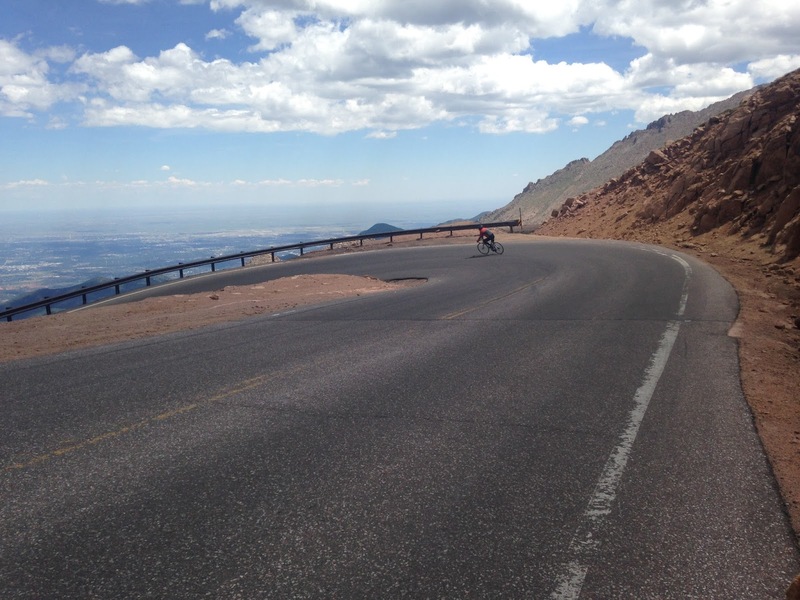 To get to the Pikes Peak Highway from Manitou Springs, you have to ride on Hwy 24. This highway is busy, yet biker friendly. There are “Share The Road” signs posted every few miles and most of the car and truck drivers were courteous. Cars gave us tons of room and trucks switched lanes to pass us. 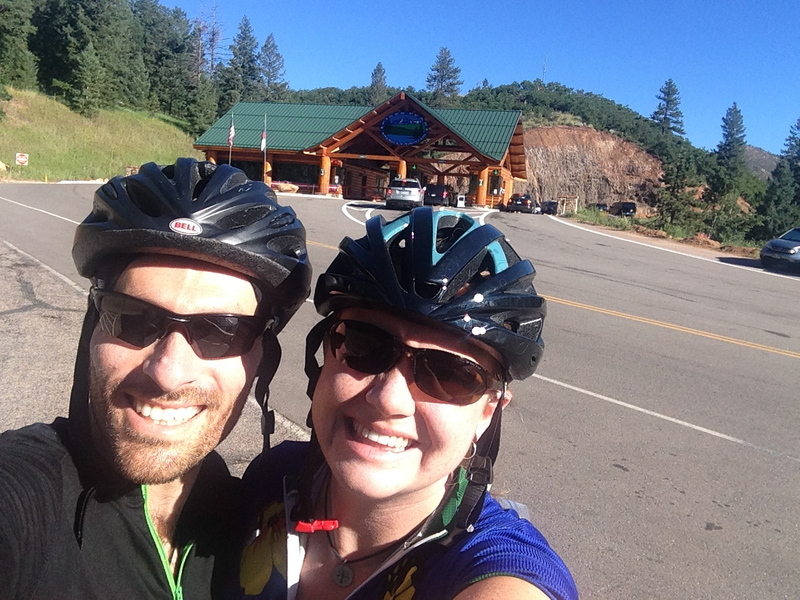 After a 4.5 mile loud but uneventful ride on the highway we turned left toward the Pikes Peak Toll Road. We couldn’t believe the grade of the road. Upwards of 10% for about a mile or so, where it started to level out near Santa’s Workshop at the North Pole. A few pedal strokes past the Workshop is the Pikes Peak Toll Road entrance gate. After paying the $12 per person entrance fee , we were on our way! The first few miles of pavement is like butter. So smooth. The road was busy, but not overly so. Tourists from all over the U.S. and around the world zoomed by us – all of them giving us ample room. Some of them shouted words of encouragement too. 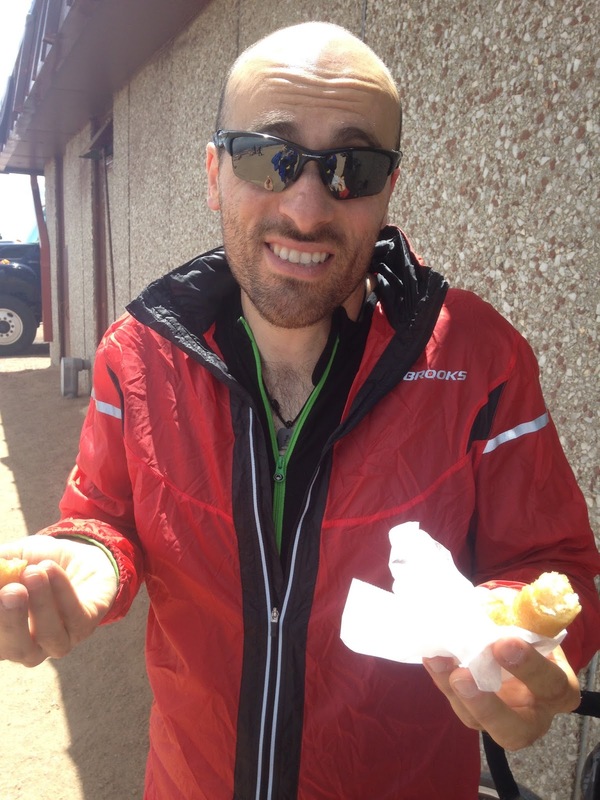 This boosted morale – especially when the going got tough later on. The first couple of miles came easy. The grade wasn’t too bad, the weather was fabulous, the mountain air smelled great and the scenery was splendid. We were making good time. Half way up the Toll Road, we stopped at the Cafe to eat a bar (or two) and top off our bottles. I was loving this ride. Laurie though, was finding it challenging. But with frequent stops, we kept on climbing. I have many nicknames for Laurie. On the bike, one of them is The Grinder. Laurie is tenacious. She may not be the fastest rider, but she will get to the finish line. No. Matter. What. After a few more miles, we were above 11,000ft. Soon after, we were above treeline too. A long series of switchbacks past treeline lead to spectacular views of the highway and valley below. At the turnout above, we met super friendly motorcycle riders from Maine. They were in Colorado for a wedding, then off to the Sturgis Motorcycle Rally. I love how unique experiences can unite strangers. We were all riding the Pikes Peak Toll Road. We were all on two wheels. They had engines between their legs and we were the engines. No matter. It was about the experience of the mountain. We knew the grade was going to be steeper for the second half of the ride. And coupled with less oxygen, we began to slow. We knew we could make it to the top. But we had to set ourselves up for success. By constantly encouraging each other, playing music and taking frequent breaks, we were making great progress. Scary grey clouds were starting to collect at the summit. But we were so close. One final push. That’s all we needed. After a short break, we pedaled onward. And a half hour later, we made it to the top of Pikes Peak!! 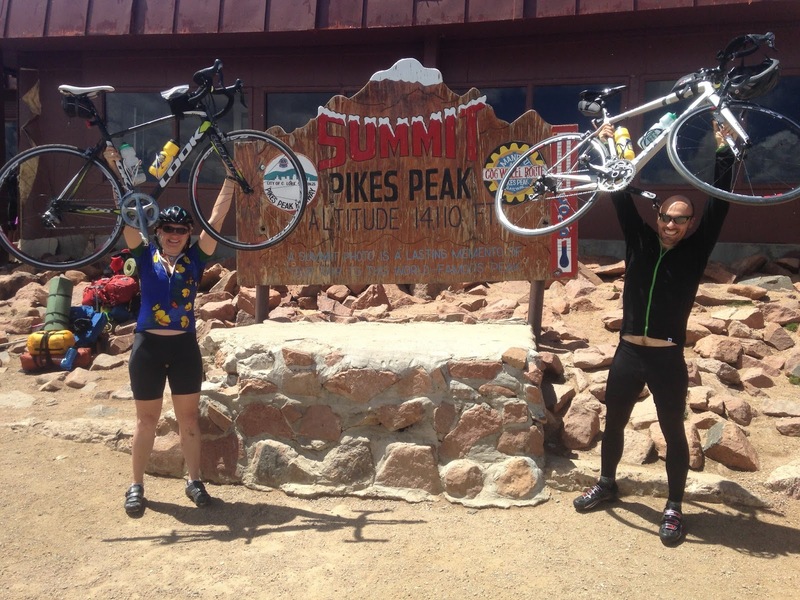 “That was the hardest thing I’ve ever done in my life” Laurie said once we reached the top. While we both agree she was having an off day, this ain’t no easy bike ride. But it sure is beautiful. After taking our celebratory pictures, we went inside to sample the highest doughnuts made in the world. I was expecting big doughnuts of all flavors and theirs couldn’t be more different. Oh these expectations of ours, they can lead to such disappointments. Honestly though, these doughnuts were so small and oh so bland. Not worth it. We relaxed at the summit for what seemed to be an hour. 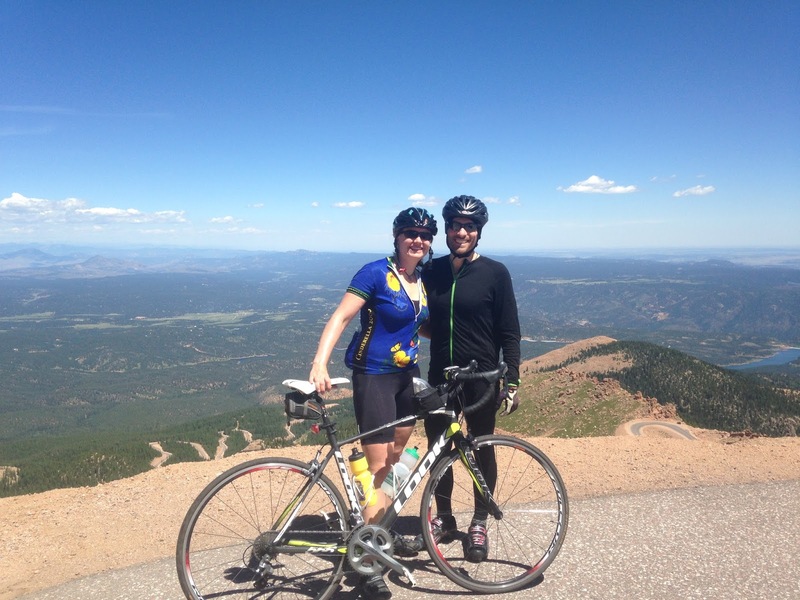 We chatted with other riders, ate our bars and enjoyed the views. 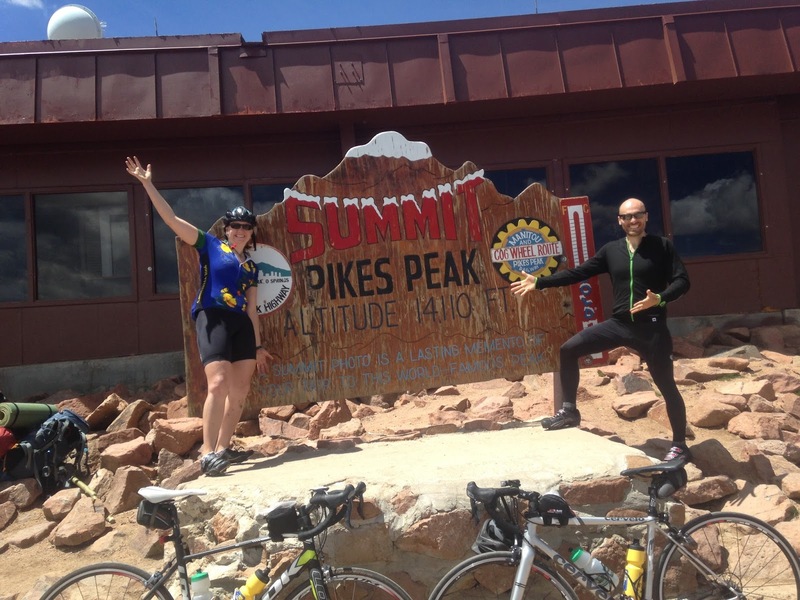 When the Pikes Peak Cog Train arrived and hundreds of tourists disembarked, we left. The downhill was fun but the views were very distracting. My goodness this mountain is pretty. 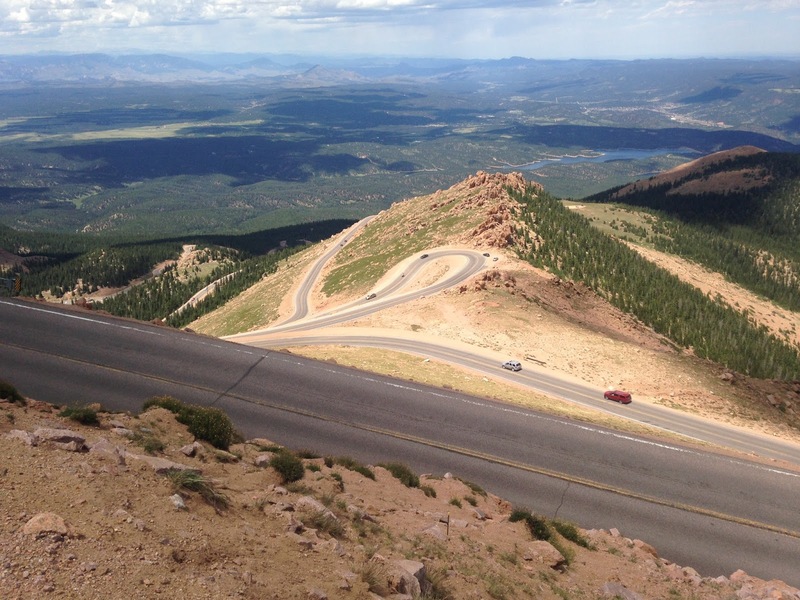 Going downhill really fast can be problematic because of the views, but slow cars can also hold you up. No matter though. We were really enjoying ourselves. Just before reaching the Cafe, there is a break check station where cars must stop. We chose to stop too. The ranger thanked us for stopping and went on a rant about cyclists who constantly blaze past the checkpoint. The rest of the downhill run was fun and straightforward. There are a few bumpy sections but nothing too bad. With two miles left to the entrance gate, we met up once gain with the bikers from Maine. They were enjoying their adventure as much as we were enjoying ours. We said our goodbyes and continued down the mountain. 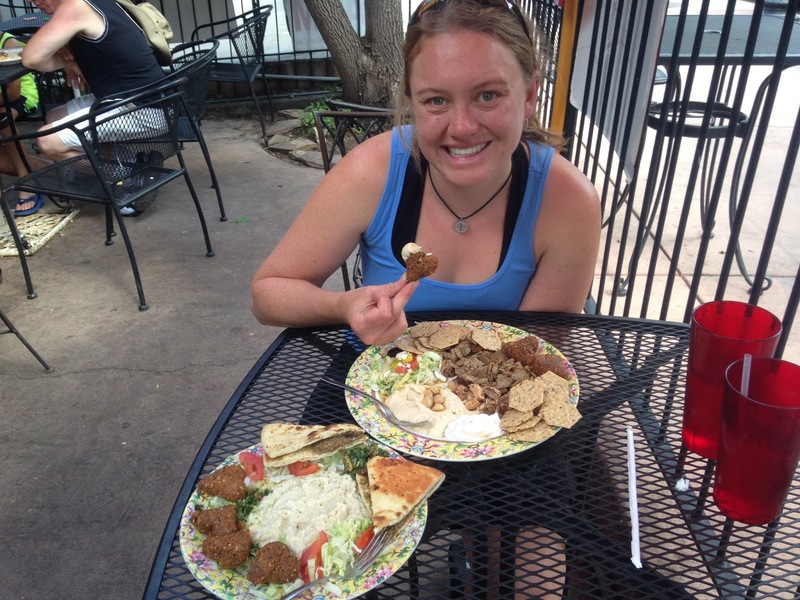 Once back in Manitou Springs, we changed into our cotton clothes and went in search of lunch before heading home. Our search didn’t last long. We chose to eat at the restaurant next to the parking lot called Heart of Jerusalem Cafe. Notice the heart shaped felafels. Nice touch. Great meal to cap off a great ride. 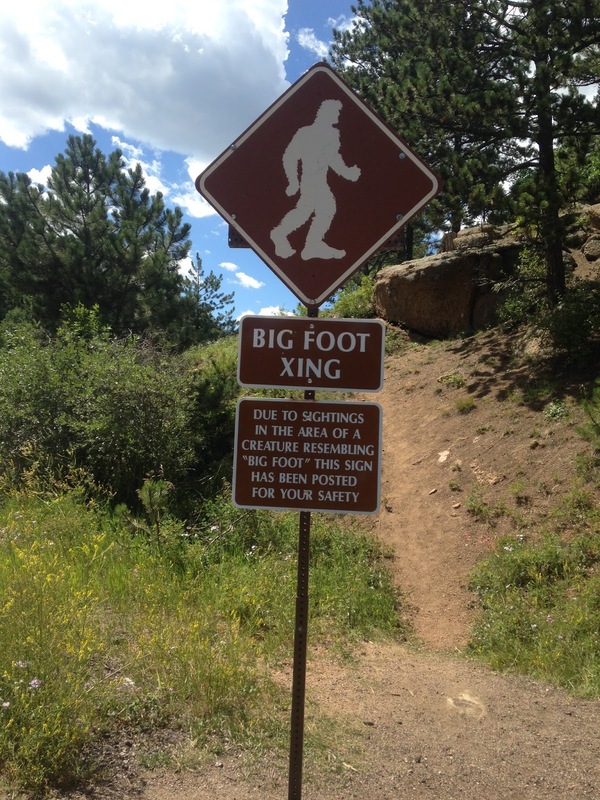 Skip the ride from Manitou Springs to Cascade (the beginning of Pikes Peak Highway). The highway is loud and cars have a 55mph speed limit. It didn’t add to the scenery of the ride at all. 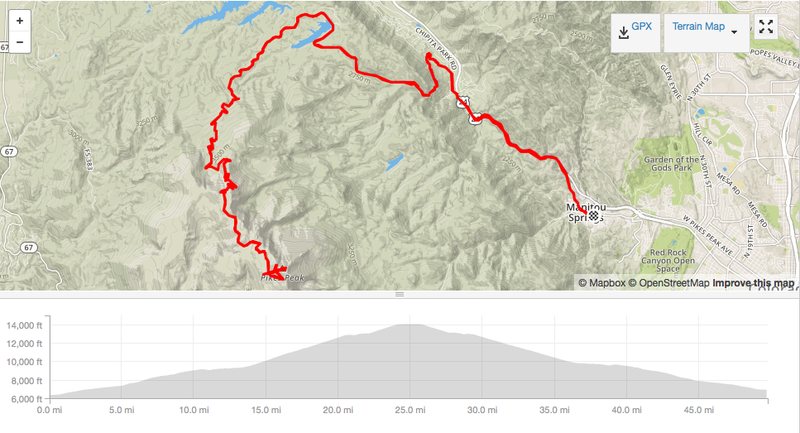 If you want to pad your stats, then ride this portion too, but next time I’d bypass Manitou Springs and start my ride in Cascade, Colorado. 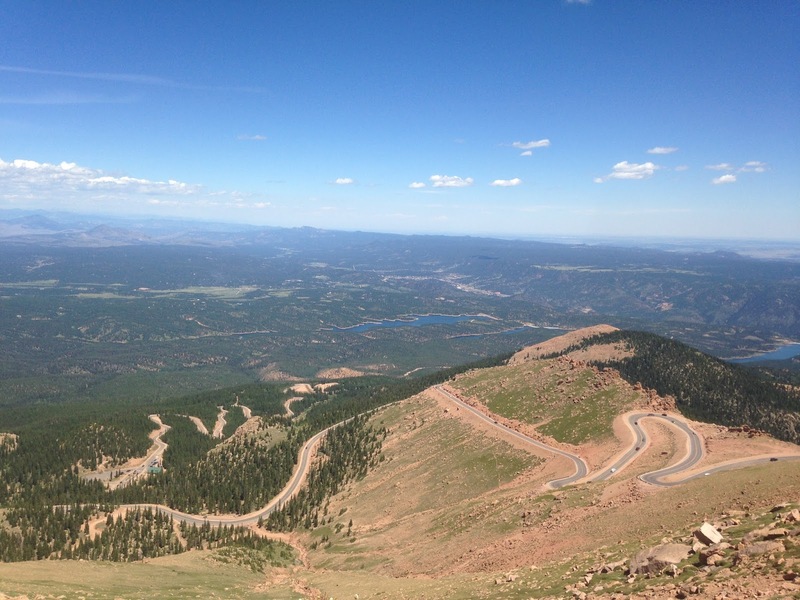 Figures suggest that the average grade of the Pikes Peak Toll Road is 6.5%. But this is misleading. For most of the miles on this road, you’re either going flat (or downhill in a few sections), or steeply uphill. It may average to 6.5% grade, but you won’t be riding that grade much.